"Becke & Summerfield 114pp. Large format Mint hardback 34 colour maps. This is a gem of a unique study. It is a transcript from a beautiful notebook which the distinguished historian Archibald F.Becke created in 1907. 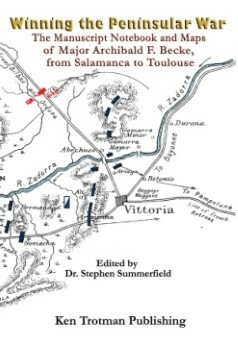 Becke notes deal largely with the strategy of the period involved, fascinatingly from the point-of-view of an early 19th Century historian who particularly understood horse transported warfare, only a 100 years away from the time he wrote. But the real gem are his exquisitely drawn colour maps which are faithfully reproduced as well as a few other maps either from another source or which were included in the notebook. This book goes well with our bestselling WATERLOO LOGISTICS."